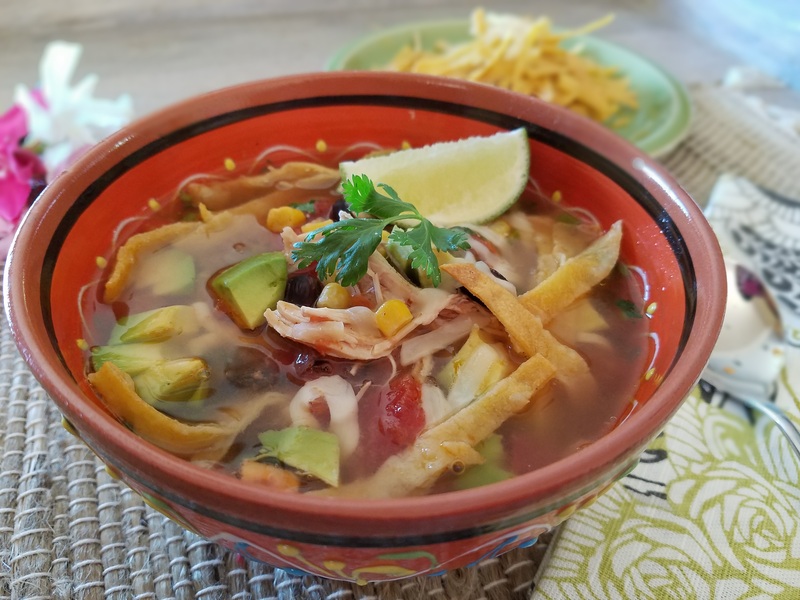 I tried chicken tortilla soup at Amardillo Willy’s a couple of weeks back and I was pleasantly surprised how good it is. The soup has a nice blend of spicy and sour taste with melt-in-your mouth tender chicken. It is nicely complemented by the crisp and crunchy tortilla strips. This is probably my first post of a Mexican dish, but certainly won’t be the last. It strikes a cord with me because the ingredients are so colorful and so are the serving dishes! Prepare tortilla strips by brushing each tortilla skin with some olive oil and sprinkle with kosher salt. Cut each skin into 1/4 strips. Arrange on a baking tray in a single layer. Bake for 10 mins until the strips are golden and crispy. Cool completely and store in air tight container. 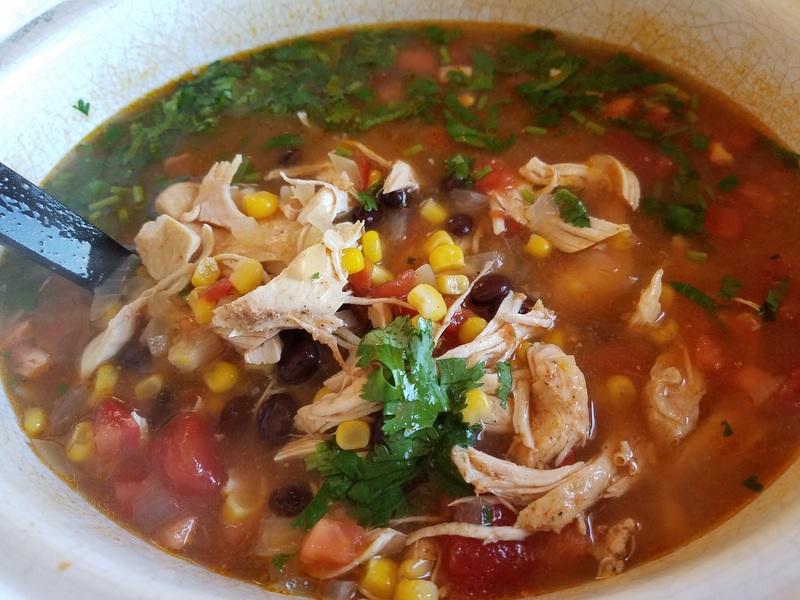 Place all ingredients for soup in a slow cooker and cook on low for 8 – 10 hours. Remove and shred the chicken tenders if they are still in big pieces. Return the shredded chicken to the slow cooker. Adjust taste of soup with salt, pepper and additional squeeze of lime if desired. When ready to serve, stir in diced avocado, tomatoes, and chopped cilantro. 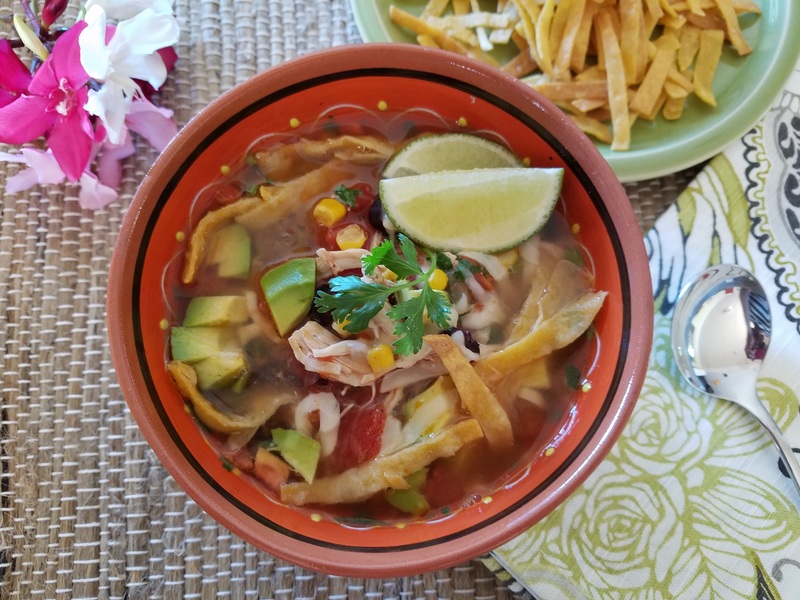 Ladle soup into serving bowl, and garnish with cheese, tortilla strips and additional pinch of chopped cilantro and lime wedges.